Individuals are admitted to the Civil Treatment units of Florida State Hospital by way of a network of Receiving Facilities covering the Northwest Region which includes Circuits 1, 14 and 2 (plus Madison and Taylor counties from Circuit 3), and three counties in the SunCoast Region (Hillsborough, Pinellas and Pasco). As part of the continuum of mental health services established by the Florida Mental Health Act (Baker Act), the Hospital serves persons 18 years and older who have exhausted the less restrictive available alternatives in the communities. Persons may be either voluntary admissions or admitted involuntarily by means of judicial order. Individuals are also transferred to the Civil Treatment units from the Forensic programs in order to conform with the legal imperative of providing treatment in the least restrictive setting without endangering the individual or others. Every person admitted to the Forensic Program is committed by the courts and may come from any county in the State. All forensic residents have been charged with crimes and may be Incompetent to Proceed, or Not Guilty by Reason of Insanity. Civil Admission: A 97 bed unit comprised of civil and forensic step down residents which evaluates and provides psychiatric services primarily for newly admitted acutely ill male and female civil residents between the ages of 18 and 64. Civil Transition Program: A 232 bed, male and female statewide program that serves civil residents and individuals previously in a forensic setting who no longer need that level of security and with court approval may reside in a lesser restrictive civil environment. Specialty Care: This program is a 161 bed unit that serves a diverse population of individuals requiring mental health treatment and services, including civil and forensic step downs. The Geriatric component is comprised of 68 beds that provide treatment for residents with a primary diagnosis of mental illness, and who, because of age, also require significant health care resources. Of the 68 beds, 34 are certified as a Distinct Part by the Centers for Medicare and Medicaid Services. Additionally, there are 61 long term beds for male and female residents with major emphasis on re-education and rehabilitation of individual behaviors. Lastly, the program serves 32 male and females with dual diagnoses of mental health and developmental disability. This program utilizes a token economy system to encourage participation and modification of behavior beneficial to community re-entry. 2. FORENSIC SERVICES. Florida State Hospital has long evaluated and treated Florida citizens with felony charges who have been adjudicated Incompetent to Proceed or Not Guilty by Reason of Insanity. Defendants in criminal proceedings were admitted to a single ward in the 1960s and in 1973 the first forensic ward was opened. Forensic Services now contains 469 beds located in two different sites on the hospital grounds. 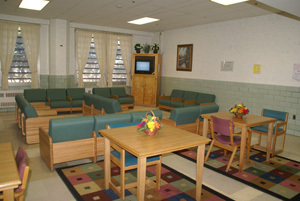 Forensic Services residents are housed in Forensic Admission Unit, and the Forensic Central Service. Forensic Admission: The maximum security facility contains 175 beds for male forensic commitments. Primary activities are assessment of new admissions, short-term treatment and competency restoration for defendants Incompetent to Proceed, and behavior stabilization for persons committed as Not Guilty by Reason of Insanity. There is also a medical complex with an infirmary, and dental clinic. Forensic Central: Forensic Central provides longer term treatment for male residents and is the female admissions area. Forensic Central has 183 male beds and 111 female beds, totaling 294 beds. This unit primarily serves a seriously and persistently mentally ill population of males and female defendants who are Incompetent to Proceed or Not Guilty by Reason of Insanity.